It’s not always about text “marketing.” Church texting communication is just as popular, and thousand of churches nationwide take advantage of this service. 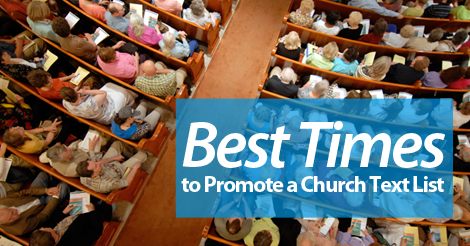 It helps them keep in touch with the congregation, expand their reach, and spread a message outside of Sunday service. Now, if you want to give text communication a try, make sure to tout your program on these important, “high traffic” days. Invite new and returning members to sign up during your Christmas service. Although you might not attract regular traffic on this holiday, this is an opportunity to reach out to new visitors. Connect with new attendees at the Easter service. Take advantage of popular annual events. Let’s say every July, your church throws a block party, in hopes of reaching out to neighbors in need. Print out opt in details on event flyers. Or, give it a mention on your social media page. In regards to text communication, here are a few key tips to remember. 1. When using SMS for churches, you’re not marketing. Instead, focus on communicating. Fire out general announcements, event reminders, etc. 2. Respect the frequency. Only fire out valuable, important messages. Don’t use your text communication list for daily devotionals or repetitive messages. 3. Verbal engagement will probably be the most effective. If your pastor asks the entire congregation to take out their phone and opt in, you’ll definitely see the most results.